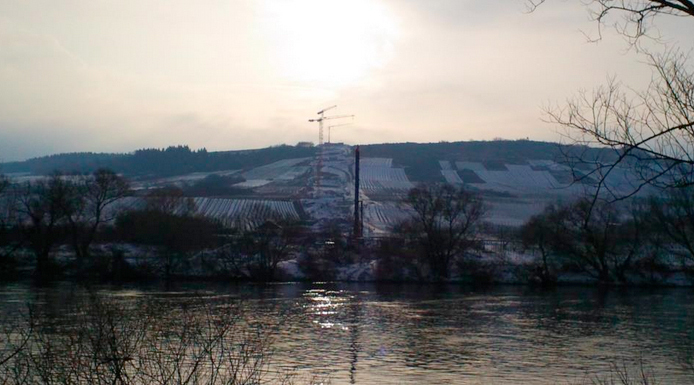 Those of you who kindly read my blog on a regular basis will be aware of the ecological, environmental and cultural barbarism currently being perpetrated in the heart of Germany's Mosel Valley. If you would like to refresh your memory, do please read "An Indescribable Folly" and "It Was Worth A Shot". Regrettably, it now appears that the building of the motorway and bridge is unavoidable although campaigning still continues. One of the very few optimistic results of the Upper Mosel Crossing is Jessica Pierce's proposal to "compile oral histories and historical research in... a film that will both discover and document the changes in the cultural landscape of the Mosel Valley". The idea is to document lives and highlight the peoples' relationship with their land, in the hope that these unique perspectives might sound warning bells whose peals will resonate into the future to prevent such destruction from being wrought elsewhere. It is an unfortunate fact that there is any number of human catastrophes in the world that need your support, but what kind of world would it be if we were to simply ignore the destruction of over one thousand years of cultural heritage? Please spare a few pounds to help Jessica make this film in the hope that brutal ignorance such as that shown by all levels of the German government will not be allowed to permit similar civil engineering policies to be enforced in other parts of the world.